Long term users of our quirky Dodo Pad have laid their lives bare and spoken of their love affair with it as part of celebrations to mark our milestone 50th anniversary. A mother keeping the memory of her late daughter alive through the pages of her notes and doodles. Two lost friends reconnecting over shared memories after years apart. A divorcee knowing they’ve always got someone to turn to. A priest wanting to stand out from the crowd at clergy meetings. Their lives could not be more different. But they all have one thing in common – the Dodo Pad diaries they have kept as a constant companion to chronicle their lives over many decades, through good times and bad. We recently launched a search for stories from our ‘superfans’ to give them the chance to share in the celebrations of our rich past. Renowned for its innovative weekly planning grid design, quirky drawings and witty anecdotes, generations have used the Dodo Pad to document their lives and keep their day-to-day goings on in order. So many people now treasure their collections of old Dodo Pads built up over the years, having filled them with their innermost thoughts and life milestones. This Acad-Pad belongs to a student who started aged 13, is now almost 21 and loves it just as much! Rachael Rushent couldn’t function this year without her Dodo Pad after her mother accidentally threw it away whilst tidying up – and she had no problem rummaging through the bin if it meant getting it back! Lady Bridie Graham has been using Dodo Pad diaries since 1978, and can laugh at many a comical tale she has documented of her children growing up through the years. Some exceptionally well-filled Dodo Pads! The Dodo Pad has also proven to be a genuine friend and source of comfort through the most tragic of circumstances. Designed by the late writer, painter and illustrator, Sir John Verney, as a way or organising the hectic daily comings and goings of his family-of-nine, Dodo Pad diaries burst on to the scene back in 1966. With their unusual and family oriented theme, the Dodo Pad immediately became the must-have ‘uber-cool’ organiser. Fast forward 50 years with me Rebecca Jay, mum-of-one, at the helm, we’re still making waves. We’ve just been included again, for the 5th year running, in The Independent’s IndyBest Top Ten diaries for 2017. Not bad for a 50 year old – and still as relevant today as in 1966. I’ve been overwhelmed with the response from our ‘Super Fans’ for the heartwarming tales they have shared and the fact that so many people treasure their Dodo Pads as lifelong friends. It really does have a personality and people relate to it. It’s funny, it’s warm, it’s witty and it’s quirky and creative. It’s a unique brand that people love. What other diary brand have you ever heard people say they ‘love’ or ‘couldn’t live without’?? It has been especially moving hearing what an important part the Dodo Pad has played in so many lives over decades. It is more than just a diary – it is a true friend. People use it to tell their innermost thoughts, share milestone moments from their lives and those of their children, remember the happiest times, and use it to comfort them in their worst times. Think of all the things you value in a true friendship – loyalty, dependability and companionship – and that is what people say the Dodo Pad brings them. I saved Dodo Pad from extinction almost 21 years ago and, when I read what a difference it makes to people’s lives, I feel incredibly proud. The 2016 50th anniversary diary range was created with a decadent gold and purple cover to mark our ‘Golden Jubilee’. The new 2017 diaries feature a bright and beautiful zesty lime design to stand out from the crowd and welcome in the next 50 years. Believe it or not, it has been 48 years since we first began tickling the nation with our witty wordplay and illustrations. To celebrate, we did what any good Dodo would do to celebrate and we got cards! We didn’t receive them this time though…. 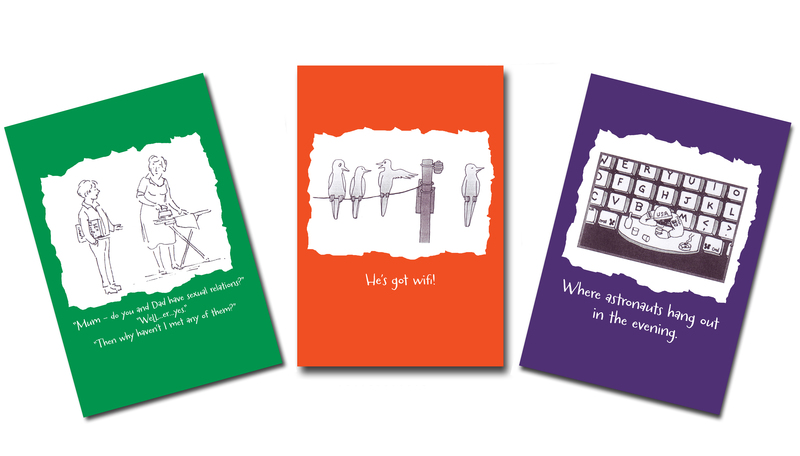 we created a brand new range of 16 cards, each designed to spread some Dodo cheer. Quirky Cartoons – from the new range! I love you SO much…. We were lucky to have the pick of a huge array of offbeat images, jokes, quotes – and sometimes utter nonsense – some of which had disappeared into the Dodo Pad vault over time. We thought that the time was ripe to unearth some of the best and funniest snippets and give people a good laugh! We’re also excited that the cards have been shortlisted in the Gift of the Year Awards alongside some wonderful card and wrap creators, and we have our fingers crossed for the 2nd February when the winner is announced! Watch this space! To see the full range, click here. Do have a look – whether you buy or not – and let us know here what your favourite card is! Having chosen them all, we’re curious to know what you think! If you know the Dodo Pad you will already be familiar with the fact that words are often ‘Dodo-ified. It’s just something that has grown over the years – a little bit of whimsy that Lord Dodo likes to pepper about the place. Like a well seasoned dish it’s important not to overdo it though. So you can be ‘dodevoted’ to your Dodo Pad ( a bit like this blog…) but not really ‘dododevoted’. This month we’ve been gathering together original drawings from the past half century to create a new collection of greetings cards to help celebrate and mark Lord Dodo’s upcoming Golden Jubilee in 2015. 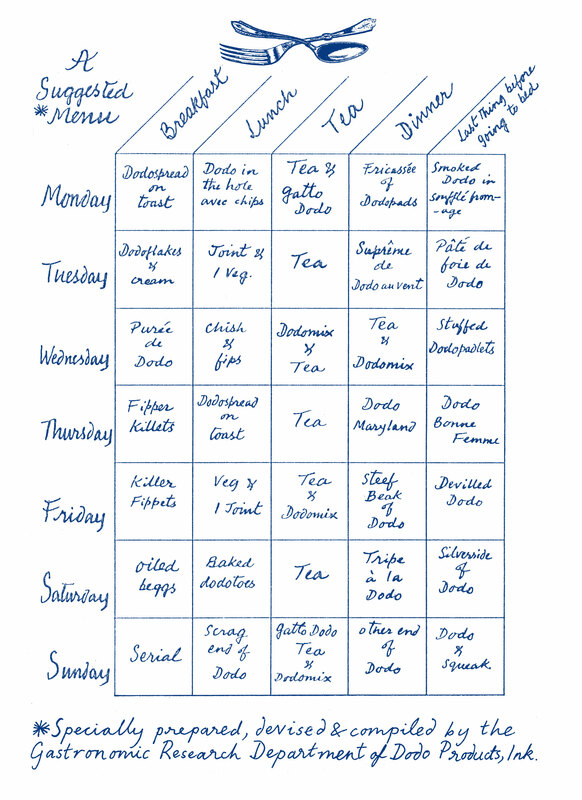 One of the artworks we found gathering dust (well not literally) from pre-digital days, is a suggested weekly menu. If you already have a Book for Cooks (that ever popular recipe organiser) it is possible you’ve seen this as it is reprinted towards the back of the book. We would love to hear any culinary suggestions you have to accompany dishes like ‘Dodo in the Hole’ or ‘Devilled Dodo’. Comment here or fill in the form on the website. The best one will win a Book for Cooks. And who knows, the residents at Dodo Towers may soon have a far more interesting bill of fare from which to choose!